Wollaston station work is proceeding nicely. Great...now how are they ever going to double-track the Old Colony through that spot??? Yeah, but we're totes going to run two branches of South Coast FAIL through there. Track shift to create room should've been in the design from Day 1. Can't facepalm hard enough at such a stupid, stupid oversight. Demolition of Quincy Center garage is complete; work has now shifted to waterproofing and station repairs. The Independence Avenue gate at Quincy Adams station is open as of early December. As part of the Fenway Center project, Yawkey station is getting a deck over part of the platforms. 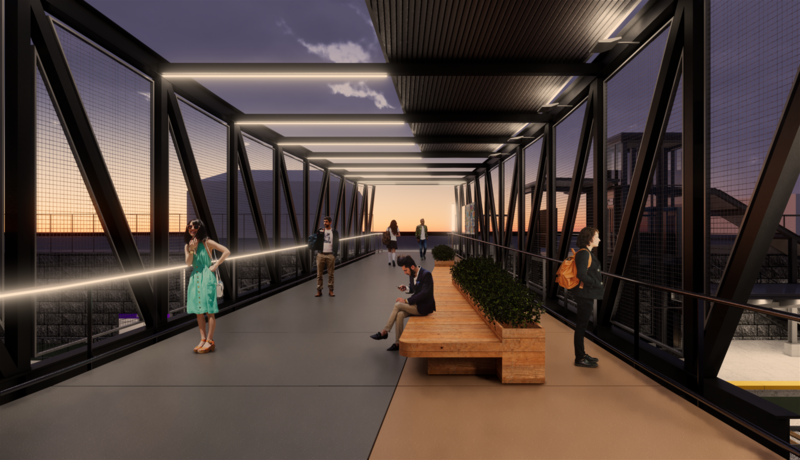 It will provide access to the elevator bridge from the development and Beacon Street. 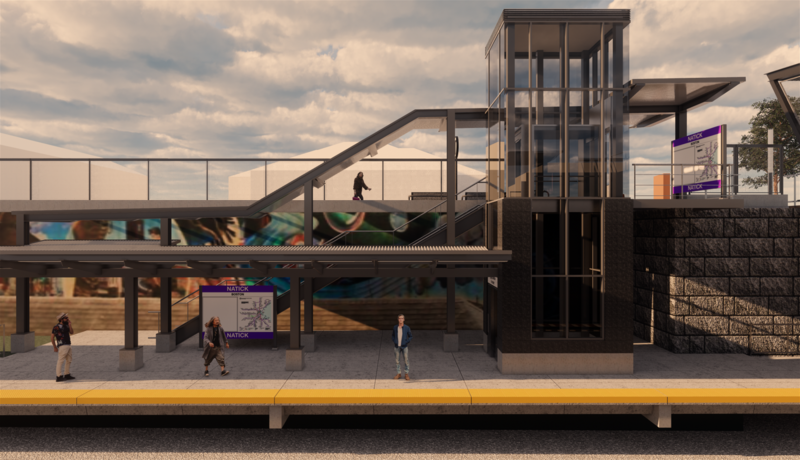 The direct stairs from Beacon Street to the platforms are temporarily cut, but renders at the site indicate they will be restored after construction. The Comm Ave reconstruction is (very slowly) coming along. Here are more-or-less completed bus boarding islands at University Road and St. Paul Street, both westbound. The walls between roadway and platform are largely in place for the new station that will replace BU West and St. Paul Street stops. Work for the Pleasant/Babcock station has not begun. I don't think there was a separate contract - the last I heard, the MBTA was planning to have it be a change order on the contract for the road work. I don't think this is full construction on the station, but rather the walls are being installed as a integral part of the roadwork, with the platforms and canopies to be added later. Are those concrete curbs in the Comm Ave project photos? If so, it would be a departure from the granite curbs used in the Boston metro area. Slipped somewhat under the radar, but the T advertises bids next month for a $21.75M construction contract for additional double-tracking on the Franklin Line. The only record I could find anywhere of where the project was located was from a Town of Norfolk meeting minutes scan from Sept. They'll be extending the current 2400 ft. passing siding south of Walpole Station immediately adjacent the Walpole Jct. diamond another 3.3 miles to the foot of the MA 115 grade crossing and Norfolk Station. It's the longest infill of DT they can swing on the line without touching any station platforms or replacing any bridge decks to drive up the project price. Another 1.9 miles of DT constructed between the foot of Norwood Central and Windsor Gardens Stations (again, not touching the platforms) attached to the Foxboro full-build budget ends up doubling the schedule: 16 Foxboro round-trips on top of the existing 16 Forge Park round-trips. +2.3 more miles of DT from Windsor Gardens to Walpole needed to implement 30-minute bidirectional schedules to Foxboro. That and +3.5 more miles of DT from Norfolk to Franklin passing track needed to implement 30-minute bidirectional schedules to Forge Park. Double-up the platforms at Windsor Gardens, Walpole, Norfolk, and maybe/likely Franklin. Pretty much knocks off a third of the required RER labor in the next year, with the fate of the Foxboro trial holding the next-most consequential stretch of track in its hands if that line proceeds to full-build. 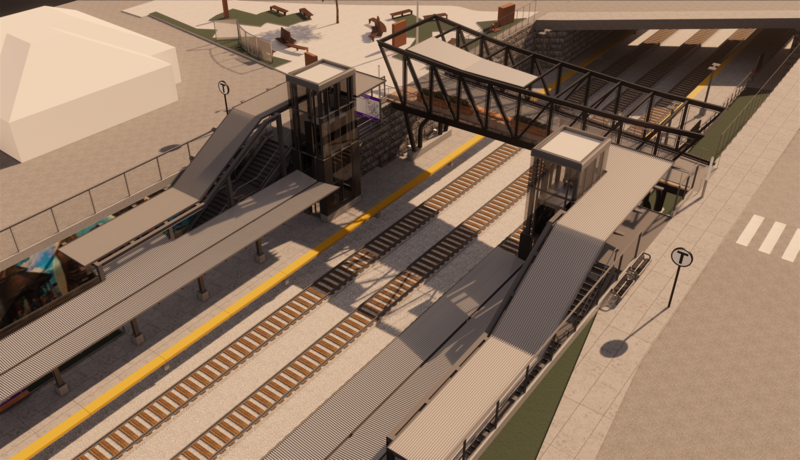 Fishing for grab-and-go double-track infill that doesn't require touching stations could be a way to get some 'stealth' RER prerequisites settled up quickly and quietly. Some of the Middleboro Line infill required to support the Buzzards Bay (or...yuck...South Coast Rail) extension and future Brockton rapid short-turns could be fodder for similar funding: 3 miles from the foot of Holbrook-Randolph Station to Montello DT, 1.7 miles South Braintree to Randolph DT. Or a pick 'em of Newburyport Line projects: 4 miles between Hamilton-Wenham Station and Ipswich passer, 3.3 miles between Ipswich Station and Rowley Station, 3 miles between Rowley Station and Newbury DT, and/or 1.2 miles between end of N. Beverly DT and Hamilton-Wenham Station. Last edited by HelloBostonHi; 02-20-2019 at 10:22 AM. 3 tracks and all high level platforms? If we're not careful we might start get confused for a city that makes meaningful investments in regional rail. 3rd passing track is optional, a residue from when Allston-Framingham was still a protected wide-load freight clearance route (that designation formally expired 7/31/2018). It'll be needed for Amtrak Inlands and maybe some Worcester super-expresses, but whether they lay Track 3 now or defer to later depends on if the station project stays on/under-budget. Direct connection to Cochituate Rail Trail is a big bonus for the renovated station. Trail will eventually run direct to Natick Mall. The only part of Worcester that needs tri-tracking is inside-128 where the Pike makes that width impossible. Service really doesn't project dense enough once the Urban Rail trains drop off at Riverside Jct. But they can get by in spite of the Pike by having overtake opportunities every 2 stations: the West Station-Boston Landing passer leftover from Beacon Park, crossovers between Newtonville and West Newton, and crossovers between Auburndale and Riverside Jct. From there it's maybe a length of passer between Riverside Jct. and Wellesley Farms for traffic-sorting after the Urban Rail trains have turned out to Riverside, this Natick Station passer, re-adapting the Nevins Freight Yard lead track as a passer just west of Framingham Station, and re-adapting the Westborough Freight Yard lead track as a passer between Southborough and Westborough Stations. That'll pretty much do it for layering a full Amtrak schedule on top of Worcester Regional Rail, Framingham short-turns or Fitchburg Secondary locals to Northborough/Clinton, and Riverside Urban Rail. It's a different traffic profile from the Providence Line which more badly needs contiguous tri-track and arguably full-on quad-track for NEC FUTURE traffic levels. And that's because of the massive speed differential between the Acela/NE Regionals going nonstop Providence-Route 128 and commuter rail making all local stops. Even on an EMU stop spacing isn't going to allow for very much >90 MPH running on the Providence Line, whereas the Regionals are doing 125 MPH everywhere from the RI border to Canton Viaduct and HSR trains doing 150 MPH (to-be 165 MPH) from East Jct. in Attleboro to Sharon. Even if you uprated significant portions of the Worcester Line to 90 MPH--pretty much the geometrical max, since any individual stretches that could go 100+ aren't nearly long enough for meaningful schedule gains or cost effectiveness--EMU commuter trains are still going to be hovering around 80 max on those schedules because of stop spacing and Amtrak + commuter super-expresses not really exceeding 90 MPH for any long distances while traveling Back Bay--Framingham--Worcester. That's close enough degree of difference where 2-track + crossovers or the occasional easy-grab passing track is plenty good for service density.